Hans Ranum: Showing at The Mighty Nomad in Burbank Saturday, Sept. 19th. Showing at The Mighty Nomad in Burbank Saturday, Sept. 19th. 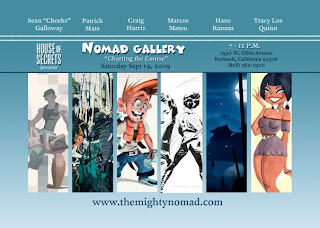 I'm proud to be showing some of my work, together with a handful of great artists, at the new gallery "The Mighty Nomad" this sat. 19th at "House of Secrets" in Burbank. Be there, or be rectangular. Way to go Hanzo..you're in good company! Wish I could go! It was a great show Hans!! Thank you for all the help, and thank you for letting me show your beautiful work!! just got back from london and dranks lots og guinness and speckled hen! I really love the artwork you have.I am working my way into the animation buisness. I was wondering if you can check out my blog when you have a chance and comment on my work. Awesome! Wish I could go!